number of working days. Well surely, they always wish to exclude not only the weekends but also the bank holidays. methodology which uses recursion in a pl/sql function. A site level profile option is assigned to global variable g_number_of_wait_days to capture the offset days. This happens during the package initialization of the pl/sql code. For example, let’s assume that we need to escalate/timeout a workflow notification after 3 Working Days. In this case g_number_of_wait_days will be assigned a value of 3 via a profile option. => Ensure that you have a table say xxx_holiday_list, in which you capture bank holidays. This needs once per year maintenance only. named set_wait_days_for_timeout within a pl/sql package. Oracle workflow calls a procedure that in-turn calls a function names get_timeout_minutes. 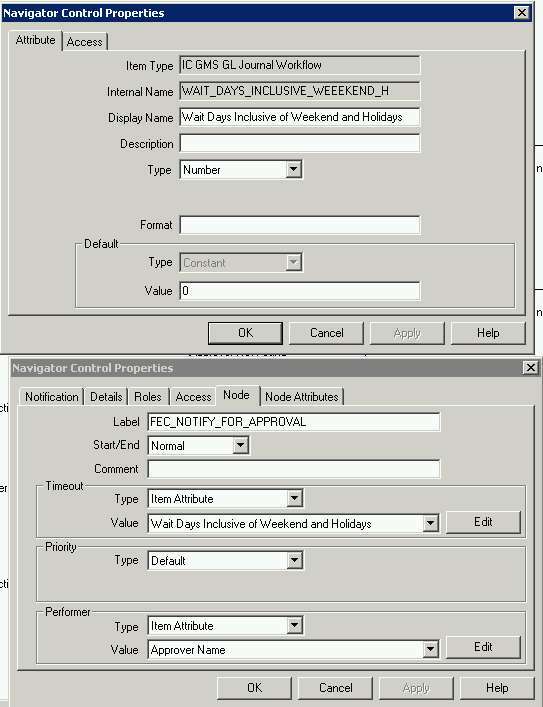 encountered plus the offset days as defined in a site level profile option. Finally, the approval notification is assigned the Workflow Attributes that dictates the timeout in minutes. My 2 cents, to my knowledge I am not yet aware of an out of the box solution from Oracle. Until Oracle Workflow delivers one out of the box, please feel free to use this methodology. Ya Let me have a go at this and will get back. One doubt... Is timeout always in minutes.... or we must do some setup for that...??? .otherwise i should not send notification to user. how to do it? concurrent program to complete the timedout activities, then only the this scenario will workout right?.. Please confirm this. I have a requirement for AP Invoice workflow customization. The scenario is like this. Approval notification email goes to an approver. If there is no response from the approver after 2 days, a reminder email notification is sent. Parallely a cancellation notification email corresponding to the original approval notification goes to the approver. If there is no response from the approver after another 2 days then an escalation notification email goes to the next approver. Parallely a cancellation notification email corresponding to the first reminder notification goes to the original approver. Now the requirement here is to suppress only the first cancellation and not the second one. Is this possible? If so please share your thoughts. i need workflow customizations and examples in oracle Hrms and oracle projects modules.